Every parent knows that getting your kids to brush their teeth (and brush them well!) can be a hassle, but Colgate just made “brush-time” easier. In honor of the launch of Colgate’s new Kids Interactive Toothbrush, we’re empowering kids everywhere to be the family coach of brushing! The new toothbrush makes oral hygiene fun, teaching your child to be a better brusher with help from their favorite character’s voices. 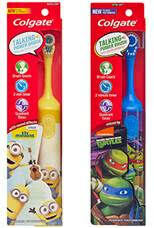 The toothbrush is available with either a Minions or Teenage Mutant Ninja Turtle. Over the years we have had a number of toothbrushes that play music, light up, etc. that help teach children how long to brush. I know that my kids tend to get lazy with the battery powered brushes. Sometimes I peek in and the brush is in the same spot. This toothbrush makes brushing fun with the coaching! There is no more guess work for kids. We challenge your kids to be the coach of brushing at your house!